Place a stick in the ground and mark the end of the Moon’s shadow with a stone or some other object. Scratch a line in the ground to join the two marks. (If the terrain is not suitable for this or the line cannot be seen clearly, use a piece of string or a straight pole etc.). Because the Moon moves from east to west, the line that you have made will also point east and west. When the Moon is waxing (between the new moon and the full moon) it follows the Sun as it crosses the sky from east to west and so, as we look at it from the Earth, its western side will face the Sun and will therefore be illuminated. 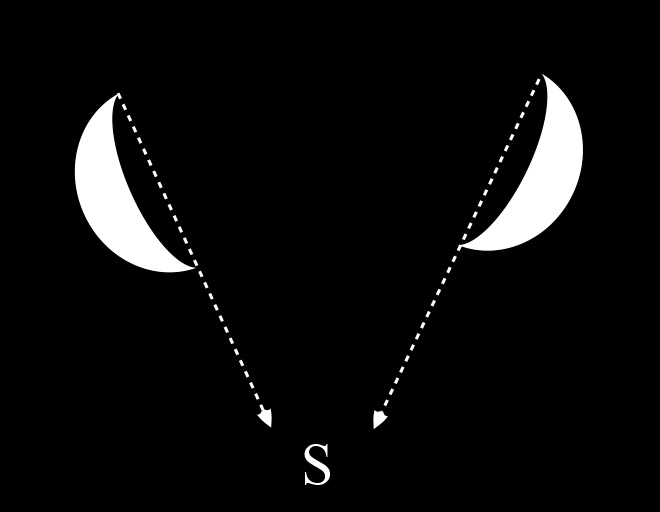 When the Moon is waning (between the full moon and the new moon) it leads the Sun across the sky and so its eastern side will face the Sun and be illuminated. This entry was posted in astro navigation, astronomy, celestial navigation, navigation, Schools, Survival and tagged astro navigation, celestial navigation, survival, survival - astro navigation. Bookmark the permalink.